Two Floors Apartment located in 15th and 16th floor in the back of a new Highrise Building recently inaugurated in Pueyrredón Avenue between French st. and Peña st. in Recoleta neighbourhood. Within walking distance to France Square and to fashionable restaurants, cafés, theatres, cinemas, boutiques and art galleries. 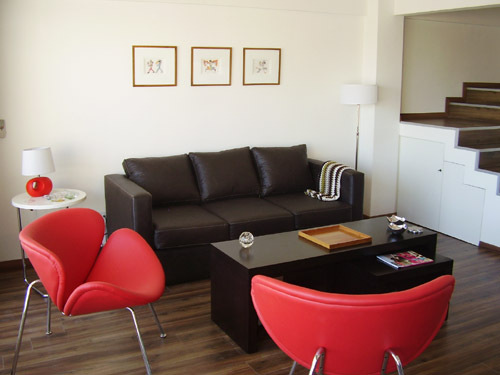 Close to Village Recoleta cinemas, to the famous Recoleta cemetery, to Buenos Aires Design Shopping Mall and to the beautiful Pilar church. Public transport: buses and metro all within walking distance. This Apartment is full of light and has a stunning open view over the city from both floors. The 1st floor consists of a spacious living/dining room with fully equipped kitchen and bar, a toilette and a balcony. In the Living room there is a double sofa bed. Dining area for eight people. The 2nd floor consists of a comfortable Main Bedroom with King Size bed and dresser, a Second Bedroom with three single beds, a full Bathroom and a balcony. There are large windows and Sunlight all day. The building provides a large Swimming Pool with Solarium, a Gym and a Laundry. Equipped with Air Conditioning warm/cold in all rooms, Cable TV, Phone with local calls included and Internet WI FI high speed connection. There is a large Swimming Pool with Solarium, a Gym and a Laundry. City centre, church, university, college, gym, pubs, restaurants, pub, nightlife area, exclusive shopping area, shopping mall, park, square, cinema, museum, art gallery, cultural centre, concert hall, historical place, market, convention centre, laundry, parking space and bike path. Included: Electricity, gas, water, internet, telephone, building and city taxes, cleaning service once a week.